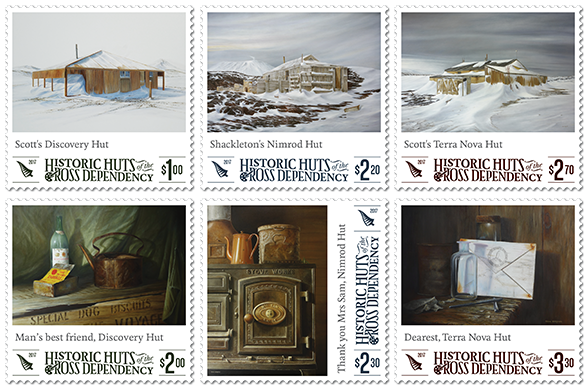 Virtual New Zealand Stamps: 2017 Ross Dependency - Historic Huts. Captain Robert Falcon Scott and Sir Ernest Shackleton have had their names and their achievements forever immortalised in history. The heroic feats of both of these men helped to pave the way for future exploration and study of the icy continent in the Geographic South Pole. The huts left behind from their various explorations have now been taken into the care of the Antarctic Heritage Trust. A plan was made to restore and conserve the individual huts, each one needed weatherproofing and repairs of some sort. 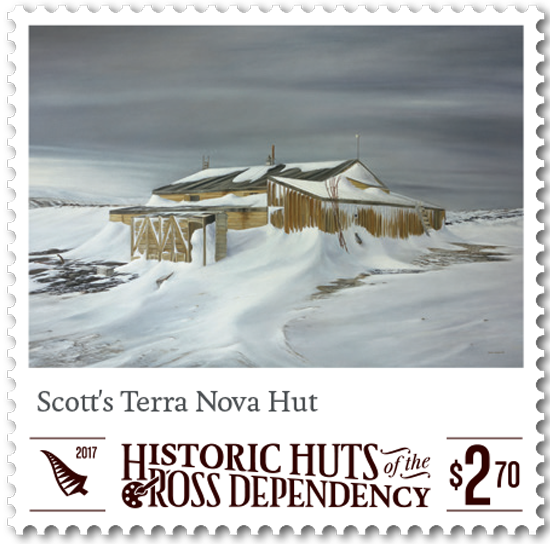 Terra Nova, the largest of the three huts took seven years to be fully repaired, and all of its 11,000 artefacts conserved. 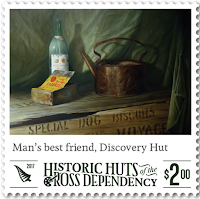 $1.00 - Scott’s Discovery Hut. Scott established this base for the National Antarctic (Discovery) Expedition 1901–1904. 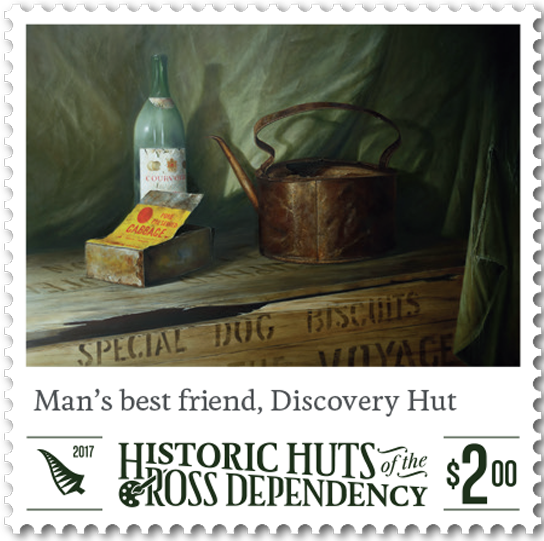 It was the first hut to be erected on Ross Island and became an important staging post for every subsequent heroic-era expedition. Built of Douglas fir and Scots pine, it was designed in Australia and resembles an outback house with large verandas. The hut turned out to be too hard to heat so the men lived aboard the Discovery and used the hut for scientific observations and other work. $2.00 - Man’s Best Friend, Discovery Hut. A nip of Cognac would undoubtedly have been welcome after being out in the harsh Antarctic environment. The hut was used to store supplies for the 47 men and their animals. Spratt’s dog biscuits, preserved cabbage, mutton carcasses, baking powder, oatmeal, gooseberry jam, cocoa, and split peas were just some of the still preserved items found during conservation work on the hut. Many of the provisions had been taken on board in Lyttelton, the New Zealand port from which Discovery sailed for Antarctica. When Shackleton went into McMurdo Sound in 1908, having failed to land on King Edward VII Land, he decided to build a hut at Cape Royds, a small promontory twenty-three miles north of Hut Point where Scott had stayed during the Discovery Expedition. The whole shore party lived in this hut through the winter of 1908. The Antarctic Heritage Trust (New Zealand) has custody over the site. 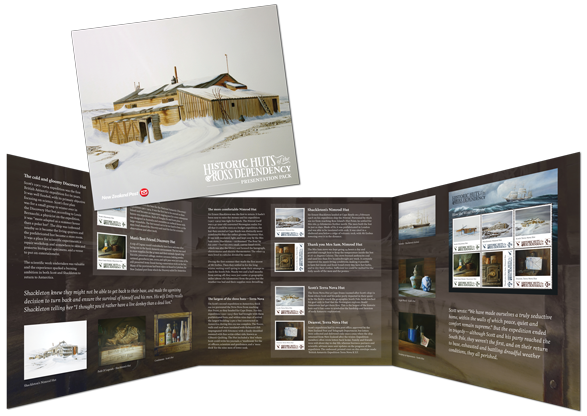 Nominated by AHT, Shackleton's Hut was listed in the 2004, 2006, and 2008 World Monuments Watch by the World Monuments Fund to attract attention and financial support for the site. In 2004, through WMF, funding for conservation was provided by American Express, and by 2008 the structure was fully restored to its condition when Shackleton's team left it. 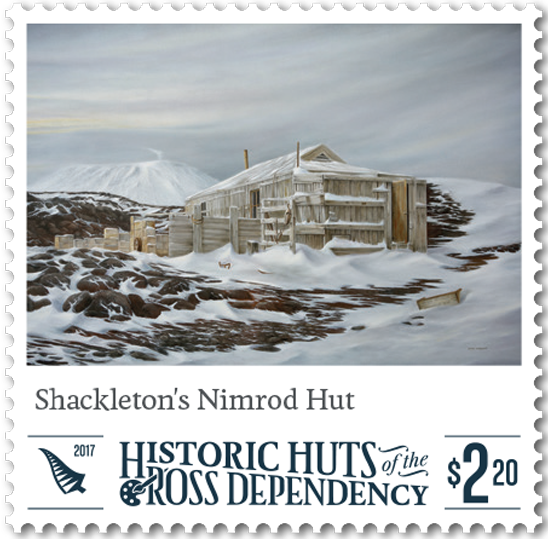 Shackleton’s Hut has been designated a Historic Site or Monument (HSM 15), following a proposal by New Zealand and the United Kingdom to the Antarctic Treaty Consultative Meeting. $2.20 - Shackleton’s Nimrod Hut. Sir Ernest Shackleton landed at Cape Royds on 3 February 1908 on his expedition ship Nimrod. Prevented by thick sea ice from reaching Ross Island’s Hut Point, he settled for this site, 32 kilometres further north. The men built the hut in just 10 days. Made of fir, it was prefabricated in London and was able to be insulated with cork. It was sited in a sheltered area below a ridge of volcanic rock, with Mt Erebus towering over it in the distance. 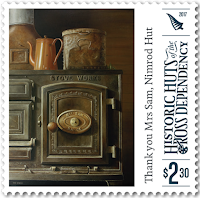 $2.30 - Thank You, Mrs Sam, Nimrod Hut. 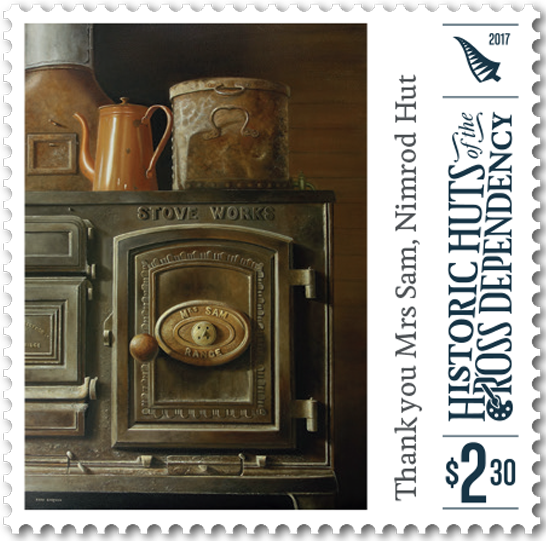 Mrs Sam’s stove was kept going 24 hours a day and provided enough heat to keep the temperature inside the hut at 16–21 degrees Celsius. The stove burned anthracite coal and used less than 254 kilograms per week. It certainly improved the men’s living conditions, making it possible to provide hot meals and fresh bread every day, hot baths, and the ability to dry their clothes. Sufficient ice could be melted for the daily needs of the men and the ponies. Scott's Hut is a building located on the north shore of Cape Evans on Ross Island in Antarctica. It was erected in 1911 by the British Antarctic Expedition of 1910–1913 (also known as the Terra Nova Expedition) led by Robert Falcon Scott. 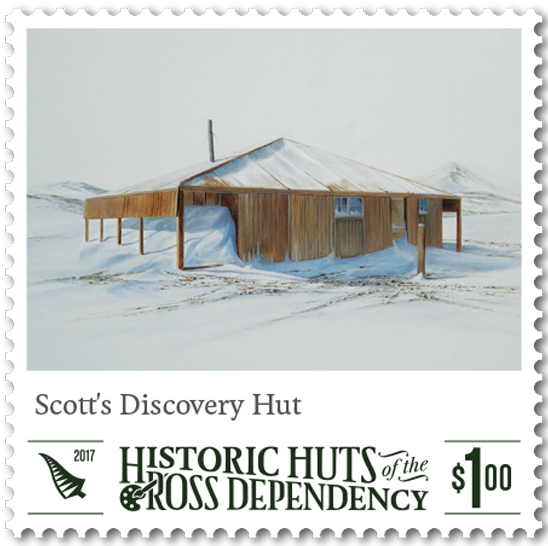 In selecting a base of operations for the 1910–1913 Expedition, Scott rejected the notion of reoccupying the hut he had built by McMurdo Sound during the Discovery Expedition of 1901–1904. This first hut was located at Hut Point, 20 km south of Cape Evans. Two factors influenced this decision. 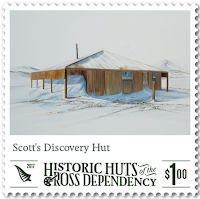 One was that the hut was extremely cold for living quarters and the other was that Scott's ship, the Discovery, had been trapped by sea ice at Hut Point, a problem he hoped to avoid by establishing his new base farther north. $2.70 Scott’s Terra Nova Hut. 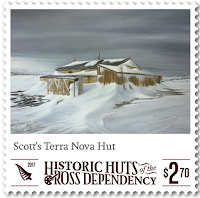 The Terra Nova Hut at Cape Evans (named after Scott’s ship) is from where Scott and his Polar Party departed in their quest to be the first to reach the Geographic South Pole. Scott reached his goal only to find that the Norwegian explorer Roald Amundsen had got there first. 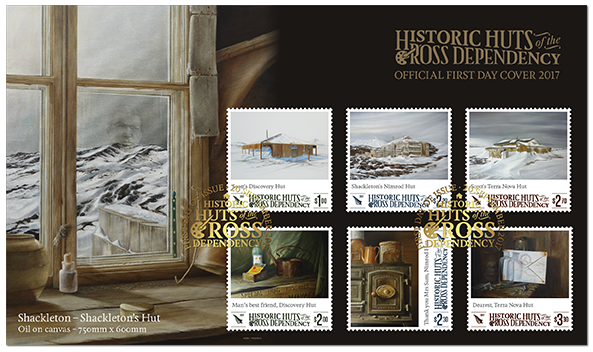 This is the largest of the historic huts and it has come to symbolise the hardship and heroism of early Antarctic exploration. 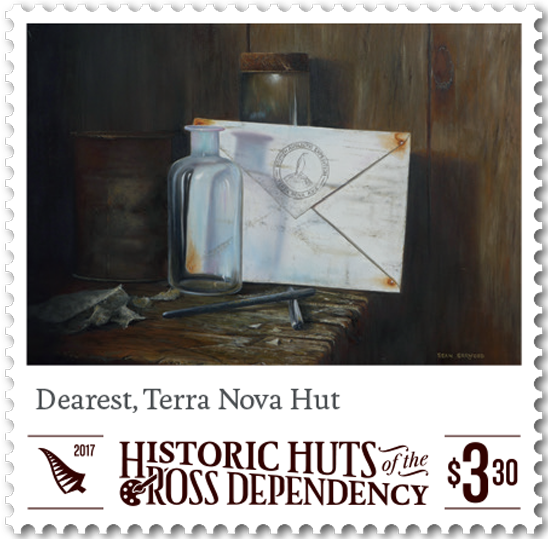 $3.30 Dearest, Terra Nova Hut. 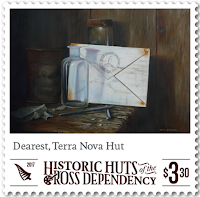 The expedition had its own post office, approved by the New Zealand Post and Telegraph Department, but letters were collected and delivered only once a year, when the ship returned from New Zealand after the winter. Expedition members often wrote letters back home. Family and friends were told about day-to-day life, whereas business partners and scientific advisers were sent updates on the progress of the expedition. 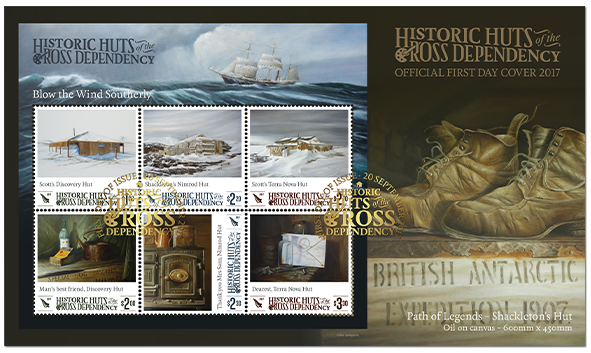 The embossed, printed crest on this envelope reads: ‘British Antarctic Expedition Terra Nova R.Y.S. 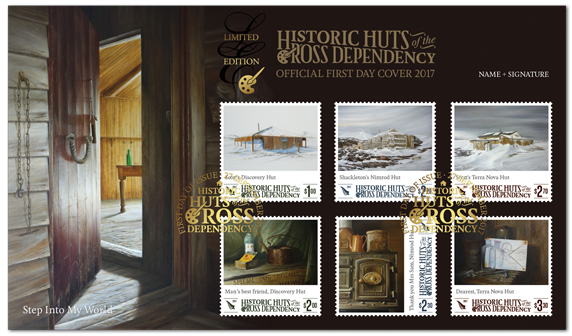 The Ross Dependency issues are always designed with the collector market in mind so this issue came with the usual items such as First Day Covers and Miniature Sheet. The miniature sheet featured all six stamps. In the top right-hand corner of the miniature sheet, Captain Robert Scott’s ship from the 1910 expedition the Terra Nova can be seen battling its way through the turbulent Southern Ocean. The ship came very close to being lost when the crew encountered a ferocious storm. The already overloaded ship was struggling greatly with handling and buoyancy. The 25-year-old ship had a tendency to take on water, a situation made much worse by the momentous waves crashing across the deck. Cargo was being washed overboard or battered around the deck, one of the dogs, Osman, became somewhat of a legend after being washed overboard by one wave and then dropped back on deck again by the next. The painting featured as the backdrop for the first day cover is Sir Ernest Shackleton. Here the reflection of the great explorer can be seen peering out across the inhospitable landscape that he explored and miraculously, against extreme odds, survived and returned to for multiple explorations until his final journey in 1922. This rudimentary, prefabricated hut nestled in the long shadow cast by Mt Erebus, is roughly a mere 10 metres long and around 5.7 metres wide. It was to be the home base for the party of 14 men that made up Shackleton’s shore party. Many accomplishments were made on this expedition, such as being the first to climb Mt Erebus, however, the much sought after title of being the first to the South Pole was abandoned when horrific weather forced the men to turn back just 156 kilometres from their target. The painting shown in the background of the miniature sheet first day cover depicts a well worn pair of leather hobnail boots. Multiple pairs of these hardy shoes were found littering Nimrod hut, most had been so well worn that they had the appearance of a second skin, each boot creased and moulded to its owner’s foot. While many types of footwear were used during early Antarctic explorations such as ski boots or crampons, the leather hobnail boots were the go to for daily use around the hut. 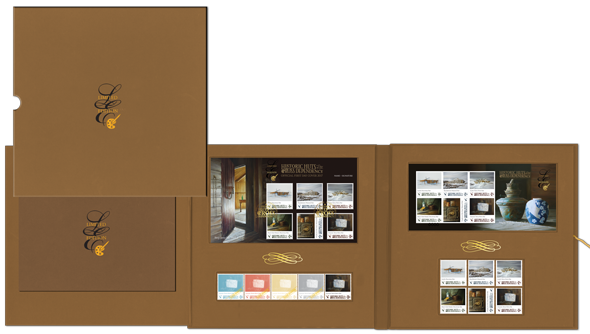 The epic achievements of Scott and Shackleton are covered in even more detail in the special presentation pack. Sean Garwood’s paintings are revealed in their full glory with extra detail about the subject of each artwork. 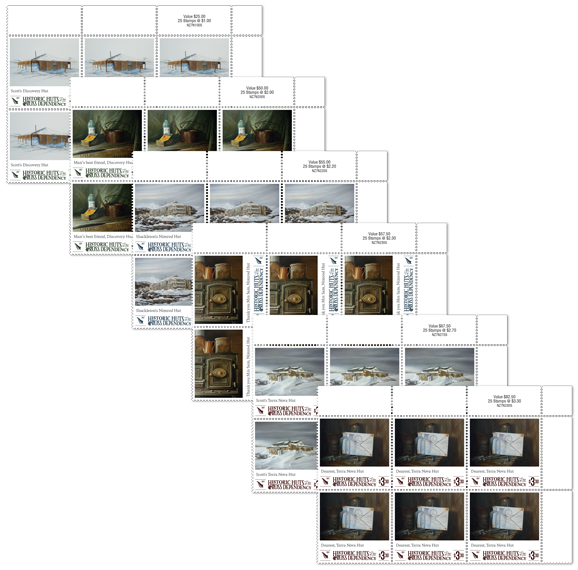 This presentation pack is a splendid collectable for anyone interested in the history of Antarctica, exploration or striking works of art. You can see the full layout on the front one showing three bar codes plus other information regarding the printing and design of these stamps. The Plate Block, in this case coming from the bottom right corner of the sheet, contains details regarding the designer and printer. It also shows the five colour printer marks too. 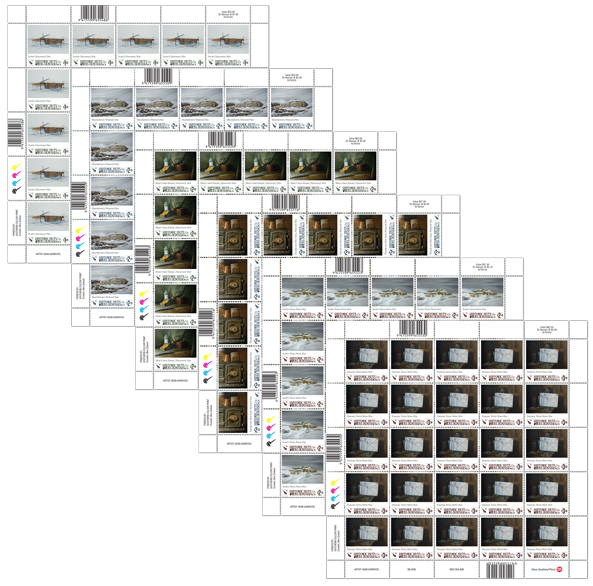 The Value Block, in this case coming from the top right corner, shows the value of the whole sheet. Of course, the value of each stamp is found on the stamps themselves. 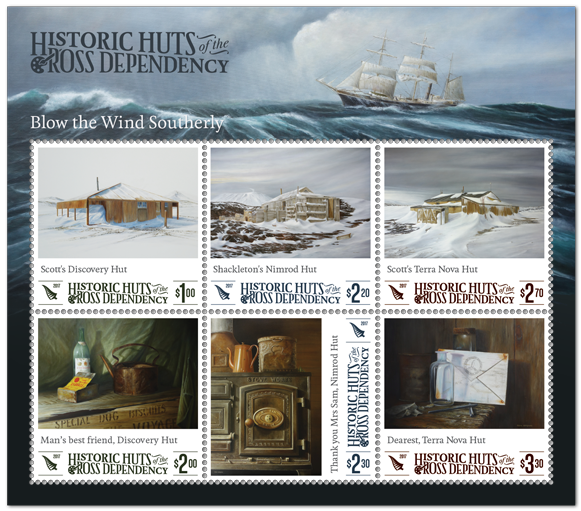 The limited edition has been written by the Antarctic Heritage Trust and contains all six stamps, a colour separation of the $3.30 stamp, and a specially numbered first day cover that has been signed by Nigel Watson, the Executive Director of the Antarctic Heritage Trust. 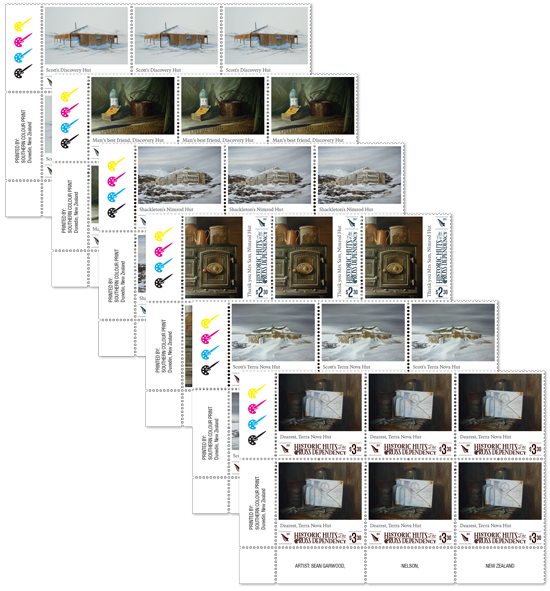 Unless stocks are exhausted earlier, these stamps will remain on sale until 5 November 2017. First Day Covers will remain on sale until 1 January 2017. What an interesting blog post. So much to read. I know some of it came from the NZ Post website but it still made a good read. I didn't realise there were three huts down there. Its good that they are being looked after now.